A common question posed by buying/selling shareholders is “how much is the company worth” and/or “how can we make it worth more”? Valuation rests a lot on prevailing market conditions. Changes in valuation may occur due to certain types of company being in greater demand, or due to some sectors being perceived to be more attractive by acquiring/investing companies. (vi) to list/float on a quoted exchange such as the NYSE/NASDAQ/FTSE100. The most suitable valuation methodology to adopt also depends on the nature of any assets held in the company – how tangible are they? are property and/or machinery being considered? – alternatively, a valuation may purely be pinned to the historic and future profitability of the company. (viii) Industry Rule of Thumb. In its simplest form an assets-based valuation requires adding up all of the company’s assets and subtracting all liabilities. As assets-based valuation is most applicable where the company is asset rich and stable in its operations (property or manufacturing companies) – it is notable that this method does not take account of the future earnings potential of the company. The starting point for an assets valuation is typically the value of the assets as stated in the latest financial statements of the company (net book value). The net book value of the assets must be adjusted to reflect economic reality – for example, fixed assets may have been under/over depreciated, property or other fixed assets may have changed in value in line with market movements or inventory may have become obsolete and need to be sold at a discount. The recoverability of receivables should be given due consideration, with any irrecoverable balances written off (conversely, any over-prudent provisions for bad debts should be adjusted for). Intangible items should be considered – internally generated/recognized goodwill should be excluded while areas pertaining to R&D (such as software development costs) may be included within the value of the balance sheet depending on the accounting conventions adopted by the Company and the jurisdiction in which it operates. As part of the valuation analysis the future prospects of the company should be considered – if the company is going to cease trading, value will be lost due to assets being sold off (potentially not achieving book value), the collection of receivables being more difficult and the cost of closing down premises and redundancy payments. The above example illustrates the Net Realizable Value (NRV) of the assets-less liabilities for a company with a simple balance sheet – after various accounting adjustments. The adjusted NRV illustrates what would remain for shareholders if the assets were sold off and the liabilities settled. However, if the company being sold is successful (and perhaps even profitable) the shareholders would expect to receive more than NRV since successful companies are worth more than the sum of their net tangible assets. 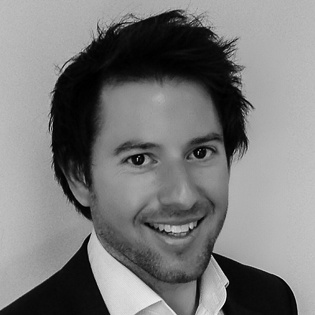 Intangible assets such as goodwill, company knowhow, brands and customer lists also have intrinsic value – none of which are likely to be captured by NRV. Net realizable value therefore represents a “worst case” scenario and a selling company should accept no less than this value. The price/earnings ratio (P/E ratio) of a company is the value of a company divided by its after-tax profit. To establish the value of a company based on price earnings its profit after tax is multiplied by an appropriate multiple once this has been decided on (from this value any debt should be subtracted and any surplus cash added to arrive at the equity value of the company). For instance, using a P/E ratio of 12 for a company with post-tax profits of $5.5m yields a P/E valuation of $66m (before adjusting for debt and cash to arrive at the equity value of the company). In terms of the appropriateness of selecting the P/E ratio methodology of valuation the company in question should be established with a demonstrable profit history. Quoted/listed companies typically exhibit higher P/E ratios – a typical P/E ratio for a large and growing quoted company with strong future prospects may be in the region of 20 (depending on the sector). A key reason for a quoted company exhibiting a higher P/E ratio is due to the greater marketability of the shares in that they can be bought and sold on a recognized stock exchange such as the NYSE/NASDAQ/FTSE100. Conversely, a comparable unquoted/private company will suffer from a reduced marketability of shares – with this serving to depress the P/E ratio. Typically, a smaller unquoted/private company will have a P/E ratio of 50% or less than that of a comparable quoted company in the same sector. Post-tax profits may need to be adjusted (normalized) to reflect the sustainable position of the company post sale/acquisition (see Box 1). In the right circumstances, the P/E ratio basis of valuation may be the best approach to take in valuing a company. However, the approach is not infallible and has some drawbacks. For instance, “earnings” are an accounting figure, which include non-cash items (such as depreciation, amortization and even provisions for potential liabilities, which may be incurred in the future). The guidelines determining earnings are dictated by Generally Accepted Accounting Principles (GAPP), which differ over time and between countries. Accordingly, when comparing two companies valued under this methodology it is possible that apples are not being compared with apples. EBITDA (Earnings Before Interest, Tax, Depreciation & Amortization) is a measure of the financial performance of a company, which can be compared with similar companies, whilst excluding the often-distortionary effects of corporate taxation, capital expenditure and financing working capital (expenses including depreciation, interest paid and received, taxation and amortization [e.g. of goodwill] are excluded from EBITDA). The “normalization” of EBITDA allows for add backs, such as excess remuneration and other remunerated benefits of directors, above-market rate expenses, substantial capital expenditure, above/below-market rate salaries, repairs and maintenance costs that should have been capitalized, professional fees, above/below market rate rent and any other additional cost adjustments considered appropriate. In essence, EBITDA is a measure of the cash flow generation of a company. When EBITDA is adopted as a valuation methodology it is used to determine a company’s ability to generate sustainable operating cash flows (rather than earnings) – a multiple is applied to this figure to arrive at a valuation (from this value any debt should be subtracted and any surplus cash added to arrive at the equity value of the company). While an EBITDA-based valuation has similarities to a P/E ratio valuation (see above) an EBITDA multiple is not arrived at in the same way that a P/E ratio would be (which, as stated above, is directly related to the performance of quoted companies on a listed exchange and where a discount [up to and over 50%] is applied for private companies). It is important to note that care should be taken to review any normalizing adjustments to ensure that they are reasonable. A negative EBITDA figure is indicative of a company with fundamental profitability and cash flow problems and therefore would preclude this method of valuation being suitable. However, a company that exhibits positive EBITDA does not automatically mean that it is cash-generative, since EBITDA does not take into account changes in the working capital of a company (often required in a growing company), capital expenditure requirements (often required to replace ageing assets or for the introduction of new products, etc. ), interest received/paid, or taxation. 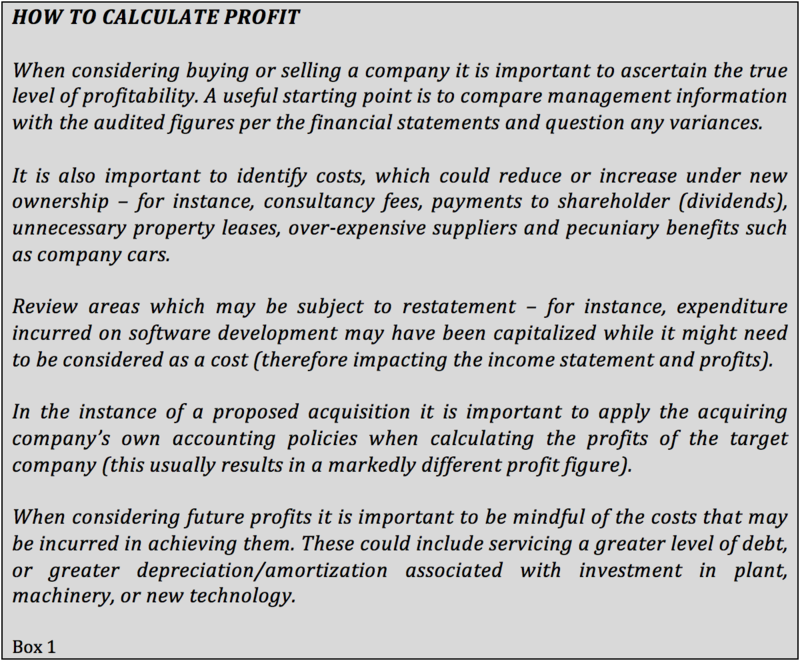 This valuation methodology is most suited to established and cash-generative companies with long-term business prospects. A DCF valuation is centered around the sum of the forecast-free cash flows of a company (say, over a five year period) and discounting them by the company’s weighted average cost of capital (the cost of equity and/or debt used to finance the company and the required return to make a capital project worthwhile) to arrive at a present value – which can then be used to evaluate the attractiveness of an acquisition or investment opportunity. In essence, DCF analysis estimates the monetary returns an acquirer or investor would receive from proceeding with a proposed acquisition or investment opportunity adjusted for the time value of money (in simple terms being the premise that a dollar today is worth more than a dollar tomorrow). There are variations when it comes to deriving future cash flows and discount rates in DCF analysis. For instance, free cash flows can be calculated as operating profit add back depreciation and amortization of goodwill (non-cash items), less taxes, capital expenditure and any changes in working capital. As part of any input estimates it is important to consider the reasonableness of any sales growth assumptions or cost increases, which the company may be subject to in the years over which the DCF covers. When it comes to estimating the cost of capital the company’s capital structure must be considered (how it finances its operations and growth from different sources). It is usual for a company to utilize a blend of debt and equity and therefore for a weighted average cost of capital (WACC) to be used in DCF analysis. A company’s WACC is the overall required return on the company and is often used internally by shareholders as a process to determining the economic feasibility of opportunities such as acquisitions and investments. It is considered a suitable discount rate to apply to cash flows with similar risk to that of the company being valued, and represents the average of the cost of a company’s sources of financing (debt/equity) each weighted by its respective proportion to the company’s overall capital structure. While DCF analysis can serve as a powerful valuation metric it is important to note that the outputs are only as good as the inputs – minor changes in inputs can alter the estimated value of a company. Furthermore, DCF analysis can also be used as a reality check. Rather than attempting to estimate a target share price, DCF users can review the company’s current share price and, working backwards, calculate how quickly the company would need to scale to support the valuation yielded by DCF analysis. A revenue multiple valuation is arguably the simplest and most common methodology used in deriving the value of a company and capturing sentiment on a company. It is a popular quick-form method to expediently value a company and can be a useful metric when comparing companies with different profit levels but similar characteristics in terms of margins, products, markets and competition. Technology companies often adopt a revenue-based approach to valuation for the reason that a lot of technology companies are not profit-generative (particularly so in the early years of operations) with a lack of profits not representing the true profit-earning potential of the company (an earnings-based valuation of many technology companies would yield a negative and therefore unusable result). Another argument in favor of a revenue-based valuation is that revenues are less impacted by accounting polices than earnings/profit-based valuations – meaning it is more likely that when comparing two companies valued under this methodology apples are being compared with apples. It is not uncommon to see companies valued at 10x, 20x, or even 100x revenue depending on where they are in their life-cycle and the sector in which they operate. These valuation levels may even be acceptable in a Series A investment round where the company in question has little demonstrable trading history to substantiate such a high valuation. For instance, a company posting $3 million of revenue in year one and $30 million in year two may warrant a high valuation because investors are willing to pay for future growth. However, while an appropriate “industry-accepted” revenue multiple may be chosen, a revenue-based valuation may be distorted if the forecast revenue figure selected is inaccurate. It is therefore paramount to question any assumptions supporting forecast revenue figures (however, revenue might be the only relevant metric available if the company being valued is in its early stages). The dividend valuation model (or dividend growth model) suggests that the market value of a company is supported by the present value of its future dividends (the value of future dividends discounted back to present value to account for the time value of money – similar to the concept adopted by the DCF basis of valuation). The variables of a dividend-based valuation are (i) the current share price of the company in question (ii) the constant growth rate in perpetuity expected for dividends (iii) the cost of capital for the company and (iv) the value of next year’s dividend. This methodology is most suited to valuing minority stakes in a company rather than a company in it entirety. Limitations of adopting this approach to valuation include the assumption of a steady growth in dividends over time, a reasonable cost of capital and that it relies on the company having a history of having paid dividends. Other considerations to be aware of if adopting this approach to valuation include that management may be pursuing an overly-ambitious dividend policy in order to support a high valuation at the expense of not reinvesting in the company to support future operations. It is notable that this valuation methodology does not account for any goodwill an already established competitor would have built up over a number of years (which an acquiring company would typically pay for). Therefore, a “goodwill premium” should be considered to an entry cost valuation to account for this. In some sectors, the buying and selling of companies is common, therefore leading to the development of industry-wide rules of thumb. Rules of thumb are dependent on factors other than profit but may also be incorporated into more common valuation methodologies where profit is the main metric - such as P/E ratio or EBITDA methodologies (such as when it comes to deriving a suitable multiple). Profit is not the only relevant metric under this methodology – indeed, a company with a large client list but no profits could be valuable to a larger competitor because the two companies could be merged and benefit from synergies. Taking account of industry relevant factors (such as turnover, customer numbers, number of outlets/sales channels) a buyer will work out what the company is worth to them. While it would be unusual for a company to be valued purely by reference to a rule of thumb, such analysis can be useful to support/disprove any analysis where a company has been valued under another methodology. When a company is bought the stake in question is very important – majority shareholders (typically in excess of 50% of the voting rights) have access to their share of profits and, because they can petition for a winding up of the company, their share of net assets. Minority shareholders have access to the dividends majority shareholders may elect to pay and a share of the net assets if the majority shareholders wind the company up. Accordingly, since minority shareholders have little power and no control, a 10% share of a company should be less than 10% of its aggregate value. Conversely, an 85% share of a company would typically be worth more than 85% of the aggregate value of the company. Majority shareholder should therefore be prepared to pay a premium for control when buying/investing in a company. When valuing a company it is important to consider synergies – the concept that the combined performance of two companies will be greater than the sum of the companies’ performance on an individual basis (where 2 + 2 = 5). In fact, synergies can often be the reason for a company proceeding with an acquisition or for two companies merging – therefore, it is often not enough for an acquirer to pay the standalone value of the company being acquired. Synergies can be achieved via increased revenue, the pooling of talent, resources or technology, the streamlining of operations and via cost-reduction initiatives. It is important, however, to consider any additional investment costs, which may be incurred as part of the transaction – failure to do so may result in a target being overvalued or even destroy value. The most obvious way synergies can be demonstrated is via an increase in the share price of the companies in question post-merger. Figure 1 below depicts how synergies are factored into a company valuation. The total synergies associated with the below transaction are comprised of the sum of the premium expected by the owners of the company when they sell and the upside the buyer anticipates they will benefit from if the transaction goes ahead. Working backwards, if the value of the anticipated synergies is subtracted from the overall value paid for the company, the standalone company valuation is arrived at. To calculate synergies in M&A an evaluation needs to be made of the impact of the synergy (such as enhanced cash flows or cost reductions), the probability of achieving the synergies (likely, possible, unlikely) and the time required for any such synergies to be realized. In terms of calculating EBITDA or other metrics Figure 2 depicts the various up and downside factors which may be associated with an acquisition/merger and therefore, the factors which may need to be considered in arriving at EBITDA (or other metrics). 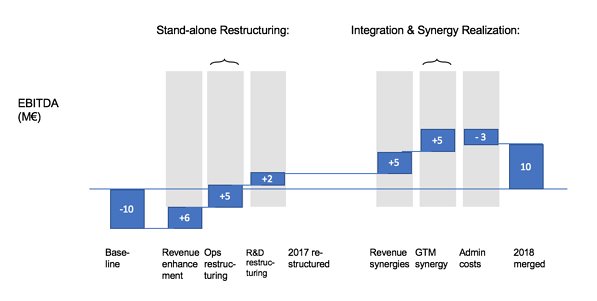 Synergies should be tangible wherever possible (demonstrable via forecasting increased cash flows for instance) and are most likely to be realized if a thorough post-merger integration process is conducted.